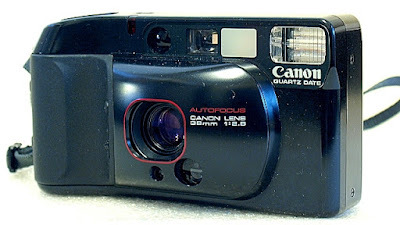 Canon introduced the Sure Shot/AF35M/Autoboy (Sure Shot in the US, and Prima in Europe) series in 1979, a series which proved to be a phenomenal success for Canon. This success pushed Canon into the limelight as a major player in the world market for consumer cameras. The original Autoboy model continued to be developed and spawns the series to Autoboy Super (1981), Autoboy 2 (1983), Autoboy LITE (1985), Autoboy 3 (1986), followed by what seems to an endless stream of model advancements till the end of its production run in 2005. In the midst of it all, the Autoboy 3 (Sure Shot Supreme in the US, Top Shot in Europe), a fully automatic 35mm AF compact camera stood up and took center stage. Reasonably priced, with advanced features packed into a very ergonomic package, the camera won the Good Design Award from the Ministry of International Trade and Industry and was also selected as the European Camera of the Year in 1986. Unique to the camera was its curving and rounded exterior, and a slanted grip which makes the camera easier to hold and handle with the viewfinder flush with the eye, comfortable for both one- or two-handed shooting. 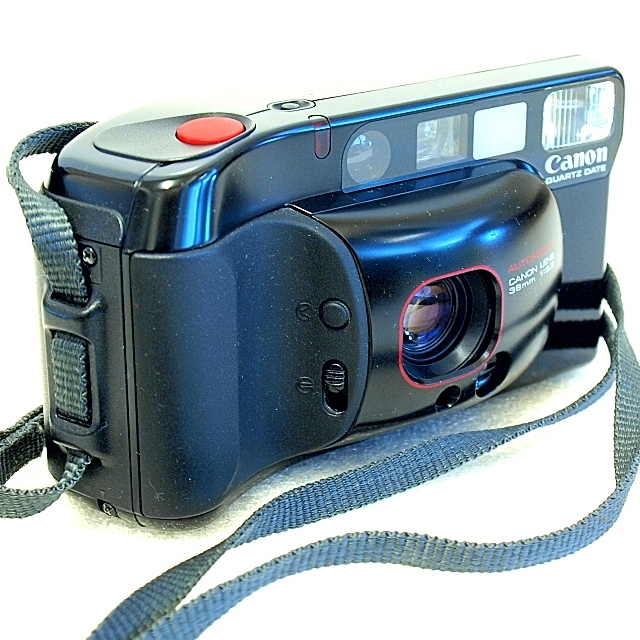 Specs wise, the Canon Autoboy 3 is a 35mm lens shutter camera with automatic film loading, film advance, rewind, and auto exposure with autofocus and autoflash capability. 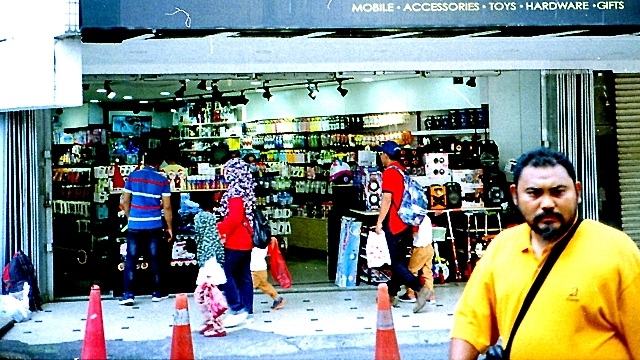 The camera is fitted with 4 elements in 4 groups Canon 38mm F2.8 lens with spectra coating. 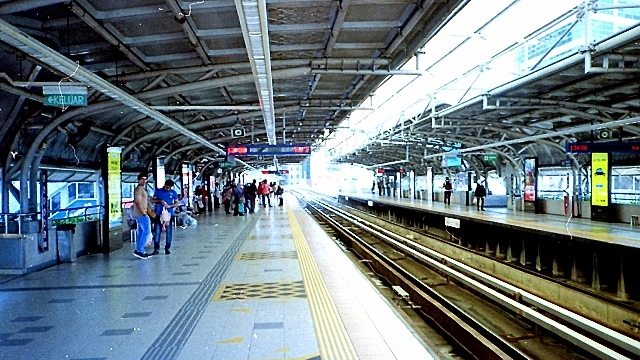 Exposure is through a programmed electromagnetic shutter, with an exposure range from 1/8sec. at F2.8 to 1/500sec. at F16. 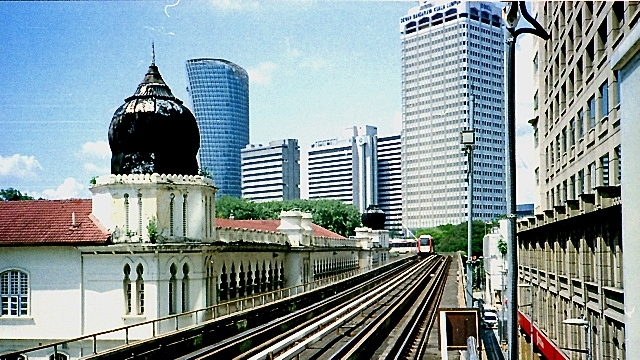 A DX coded sensor will set film speed to ISO 50, 100, 200, 400, 800 or 1600. 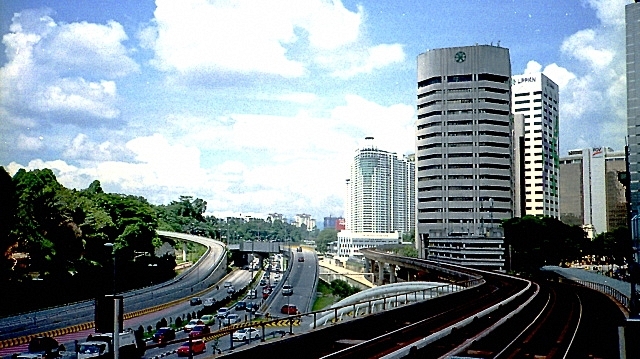 Active autofocusing is by a triangulation system with a near-infrared beam. A special feature is a tilting foot on the bottom of the camera, which allows you to place the camera on the floor while allowing for the body to be tilted up to 16.5 degrees. The camera weighs 318 grams without the battery pack. The Autoboy 3 is complete within its own encapsulated body, with no loose pieces lying around to be misplaced. 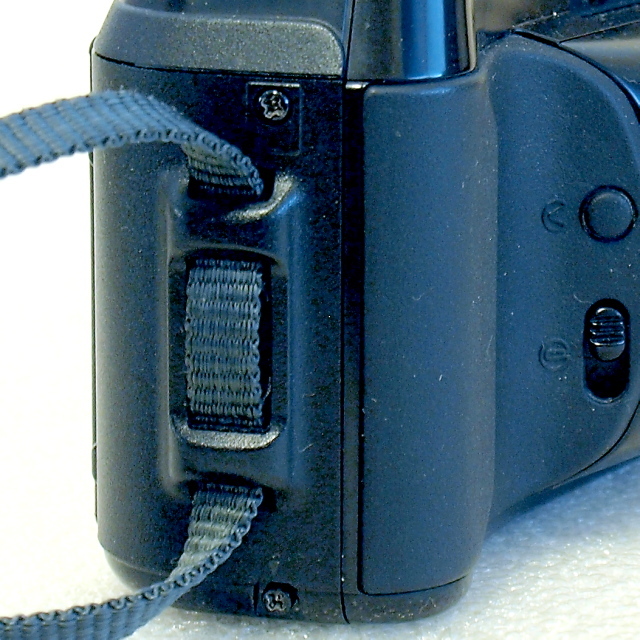 The lens cover opens with a button switch and closes with a slide switch, both of which are located one above the other on the left of the front panel where the finger grip is. Located below the lens cover panel is a smallish exposure metering Window, next to which is one of the two autofocus triangulation windows. 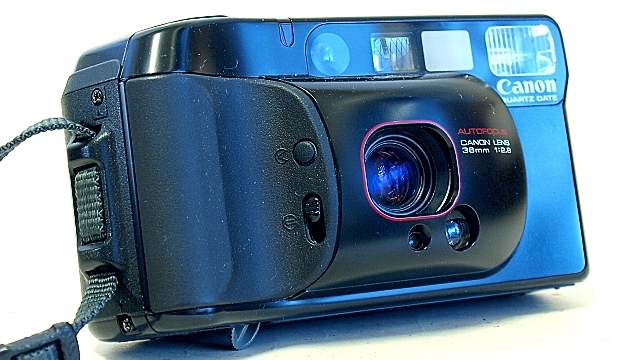 On the top of the front panel, located right to left, are the flash head, viewfinder window, the other autofocus triangulation window, and a small self-timer indicator. The shutter release and 10-second self-timer buttons are on the top panel of the camera. 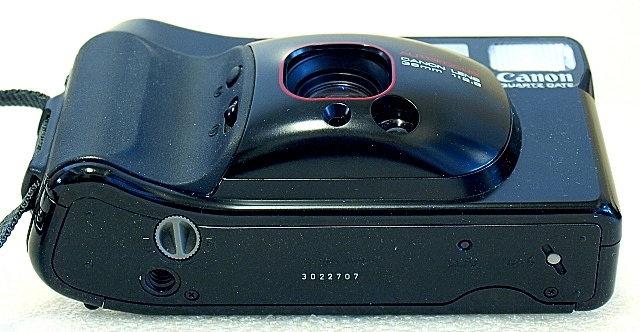 On the top plane of the back panel is the viewfinder, and the frame counter which is integrated with the battery life indicator. The film back has the film load check window, and on the edge, the back cover latch. 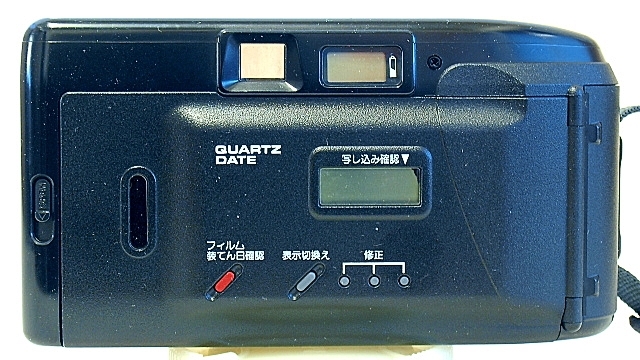 A Quartz Date version of the Autoboy 3 will have the Day/Date/Time display and setting buttons. The bottom plate carries the tripod socket, the camera tilt knob, film mid-roll rewind button, and the flash off button. The film box is a collection of mechanical components including the DX code contacts in the film chamber, film guide tips, the take-up spool, quick-load mechanism, and film tip position line. 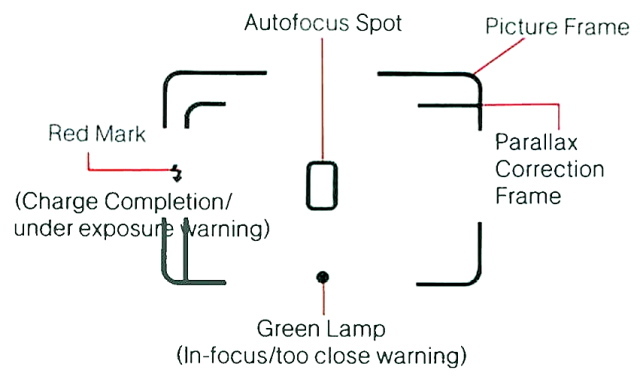 The reverse Galilean Mark finder is etched with frame lines indicating the autofocus spot, picture frame line with parallax correction, green LED at the base of the display for in-focus or too close warning indicator, and a red flash LED, located on the left side of the frame line, for charge complete or underexposure warning. Prefocusing is, of course, the technique you will want to use if your main subject is off-center, or is away from the autofocus spot in the final composition. Do this by first centering your main subject in the autofocus spot, half press the shutter to get the correct exposure and distance reading, reframe the composition with your finger still on the half-pressed shutter button before releasing the shutter by pressing the button all the way down. 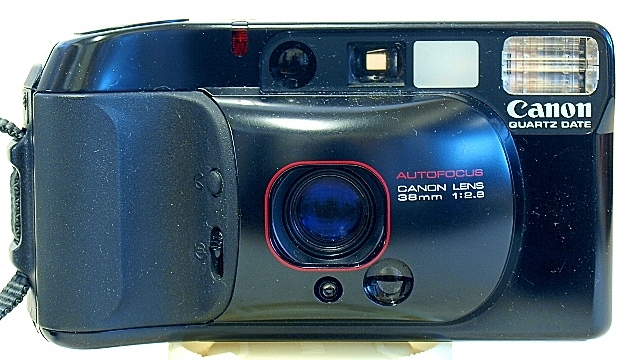 The Canon Autoboy 3 requires a 2CR5 battery to operate. The Lithium battery has an estimated life of about 5 years or 50 rolls of 24 exposure film and is located in a no-fuss screwed down compartment on the right side of the camera (the panel where the strap hook is located). Battery life check is indicated by a 4-segment LCD display located on the back of the camera's top plate. A battery change, which should be years and years away, is recommended when the power indicator is down to one segment. 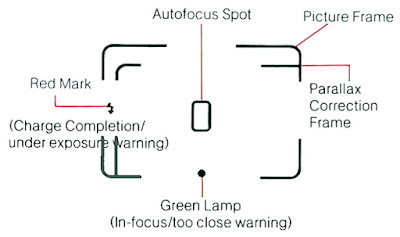 The auto flash feature of the camera will be automatic when the ambient lighting is insufficient for proper exposure, and the flash setting will go into fill-in mode when backlighting is detected. The auto flash feature can be disabled by pressing the small flash-off button on the bottom plate of the camera simultaneously as you release the shutter. On the other hand, if you want to use the flash in all lighting condition, you need to block the camera from reading the ambient light level. Do this by blocking the exposure metering window, located below the lens housing opening, with the rubber flash cap which should be together with the camera strap. 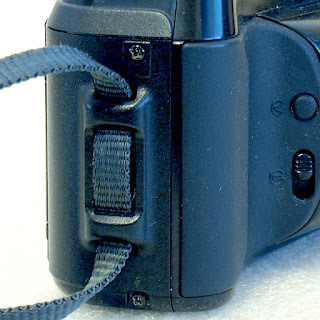 If this bit is missing from your camera strap, like mine is, try devising your own method. When doing close focus photography, where the close-up subject is within 0.55 to 1.8 meters, make sure that the subjects are in line within the parallax correction frame and is completely covered by the autofocus spot. If the subject cannot be covered by the autofocus spot, use the prefocussing technique instead. 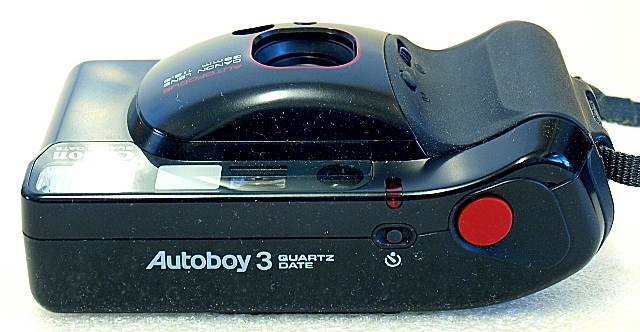 The Autoboy 3 will rewind the film automatically. The mechanism will start once the end of the roll is reached and stops when rewind is complete. While the camera was easy to carry around hanging from your shoulder, its curvy and bulbous shape is probably a better bet for the big pocket of your outerwear jacket, or handbag, rather than your pants pocket. I carry mine in a small camera bag together with the other two compacts I normally carry around. The only constraint I put myself to with the Autoboy 3 is to stick to bright daylight shots as I was not able to disable the auto flash which pops off as soon as the ambient light is low. This may be due to my own ignorance about the camera's operation. Being an autofocus camera, the Autoboy 3 is a pure point-and-shoot and is a delight to use, aside from setting the auto flash off when you want it to. 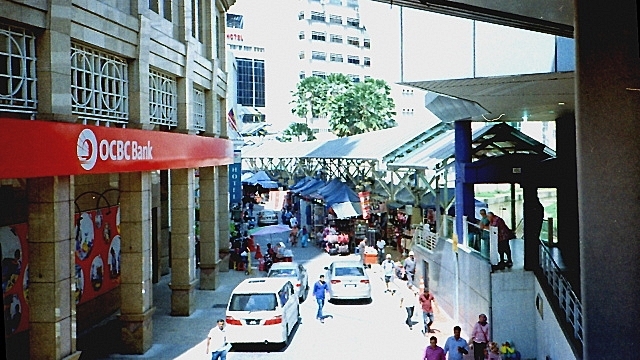 Images were scanned and post-processed and cropped to 16:9 image aspect ratio on Olympus Viewer 3 (OV3). 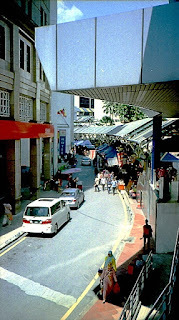 Print sharpening was done on Google NIK Sharpener Pro3.